Parsek is the fanzine produced by the SFera society, the oldest SF society in former Yugoslavia. It this capacity, it stands for PARadoxal SECular bulletin of the Society. At SFeraKon, there is a Special issue of Parsek featuring the year’s SFERICA winners in the literary categories. The SFERICA art categories get an exhibition of their own at the con. 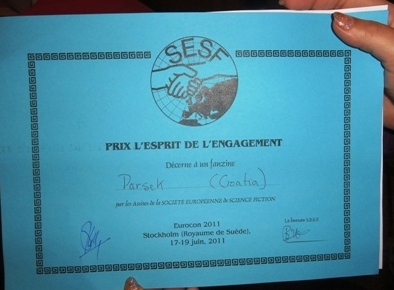 In June 2011, at 33rd Eurocon held in Stockholm, Sweden, Parsek won the Best European Fanzine award from the ESFS. Although it is the oldest fanzine in the region, it boast only 120 issued so far, but a whopping four of these are in English.